David Cameron has said he will not "rule out quotas" as a way of getting more women into top executive jobs. At a summit in Sweden, the PM said he wanted to "accelerate" the increase in women on the boards of top UK firms, preferably without resorting to quotas. A government-commissioned report urged top firms to more than double the number of women on boards by 2015. Research suggests the proportion of female directors at FTSE 100 companies has risen from 12.5% in 2010 to 15%. Mr Cameron told Nordic-Baltic leaders their countries were "leading the way in Europe" on the issue of women in top executive jobs. In Sweden, women hold a quarter of boardroom posts. In Norway, where quotas came into force in 2008, it is 40%. During a discussion he cited the figure of 30% as a likely target for women on British boards. He said he would like to boost numbers "preferably without having quotas" but said he would not rule them out "if we cannot get there by other means". He told the meeting of eight other European leaders that the "case is overwhelming that companies and countries run better if you have men and women working together at the top". Securing promotion for women and encouraging female entrepreneurs is one of the two key themes of the Northern Future Forum summit in Stockholm. Earlier Mr Cameron said the drive for more women in top business roles "is not simply about equal opportunity, it's about effectiveness". "The evidence is that there is a positive link between women in leadership and business performance, so if we fail to unlock the potential of women in the labour market, we're not only failing those individuals, we're failing our whole economy." "So I want to get ideas in Stockholm that we can take back to London to explore if they could help us get more women into British boardrooms, boosting profits and contributing to the economic growth we all urgently need." 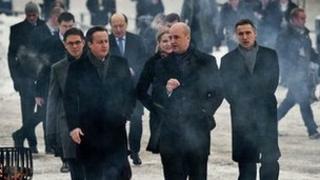 Downing Street later said the government had no plans to introduce quotas and wanted the impetus to come from business. The PM's spokesman added that the government was working with business to encourage the promotion of women onto boards. But Unison union general secretary Dave Prentis said Mr Cameron's "warm words won't fool women". "The unemployment figures don't lie - they expose how hard women are being hit by heavy public sector job losses, and the lack of private sector job growth. Tory cuts are also depriving women of the low-cost childcare they rely on to stay in work." Among the British delegation in Stockholm was the head of Downing Street's Behavioural Insight Team - better known as the "Nudge" unit - David Halpern. Nudge theory is seen as a way of encouraging behavioural change without resorting to bans or increased regulation. BBC political correspondent Robin Brant said that was clearly the favoured route for the government in getting more women on boards. In the last year, 27% of board-level appointments at FTSE 100 companies have gone to female applicants, but one in 10 of Britain's biggest firms still have all-male boards. At present, 15% of FTSE 100 directors are women. The government-commissioned Davies report last year said quotas should be imposed unless top firms acted to increase the number of women on their boards to at least one in four by 2015. A book published by two Conservative MPs - including Matthew Hancock, a close ally of Chancellor George Osborne - called for a 30% target backed by state-imposed sanctions if progress was not made quickly. But Home Secretary Theresa May, who is also minister for women and equalities, told MPs recently: "The best way to get change is to do it in a way which isn't imposing a quota on a company but is encouraging people to recognise the talents within those companies." She said the government was monitoring progress made since the Davies' report was published last year and would "work with companies to encourage them to use the talent within them".